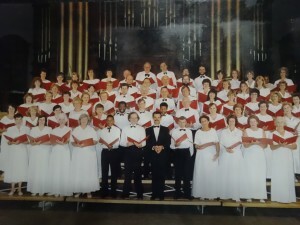 The Durban Symphonic Choir (DSC) made its debut a half century ago, in 1966, with a performance in Durban’s City Hall of Mahler’s ‘Resurrection Symphony’. 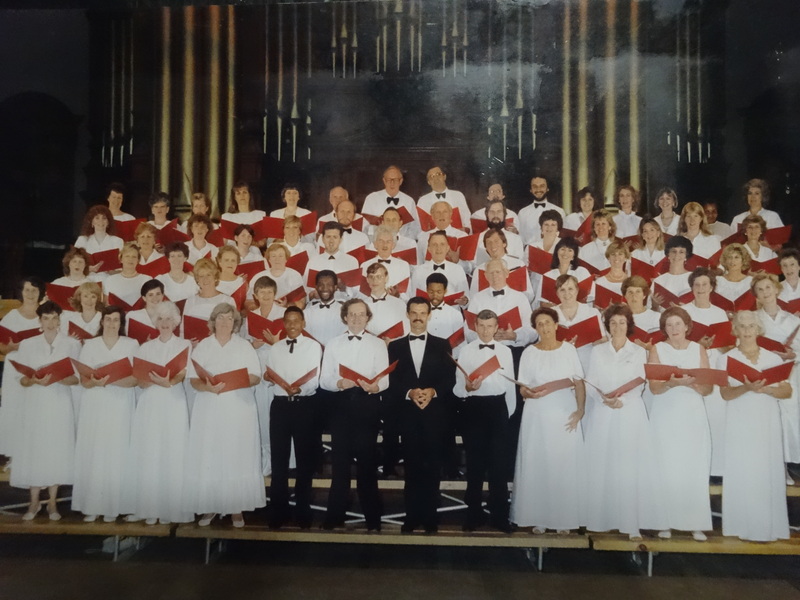 Founder member, Jacqueline Anderson, identified this as an appropriate choice for the choir – an institution infused with energy, on a mission to celebrate and deliver an infinite variety of musical works to supportive audiences. This year the DSC celebrates its golden jubilee with the same aim, intent on delivering high-quality traditional and new works to appreciative audiences. 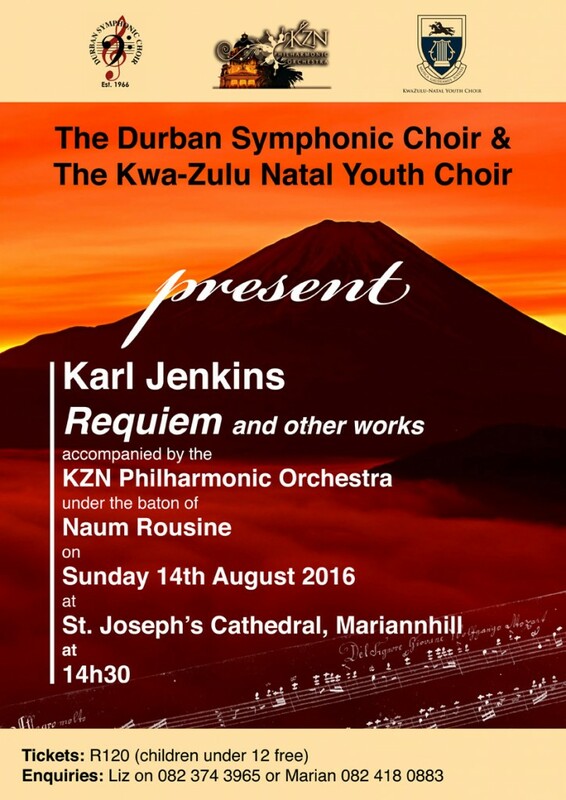 Today’s SA premiere of Jenkins’ Requiem Mass follows the March performance of Stainer’s Crucifixion. Upcoming events include the perennial favourite, Mozart’s Requiem on 13th October, and the light-hearted, popular Last Night of the Proms, on 23rd October 2016. Over the decades the DSC, under the very capable and talented directors, Heather Brandon (1966-1987), Juan Burgers (1988-1999) and Rosalie Conrad (2000-present), has tailored its choice of works for diverse audiences. Handel’s Messiah, undoubtedly DSC’s most performed work, has enjoyed unwavering support with excerpts sung at almost every concert. 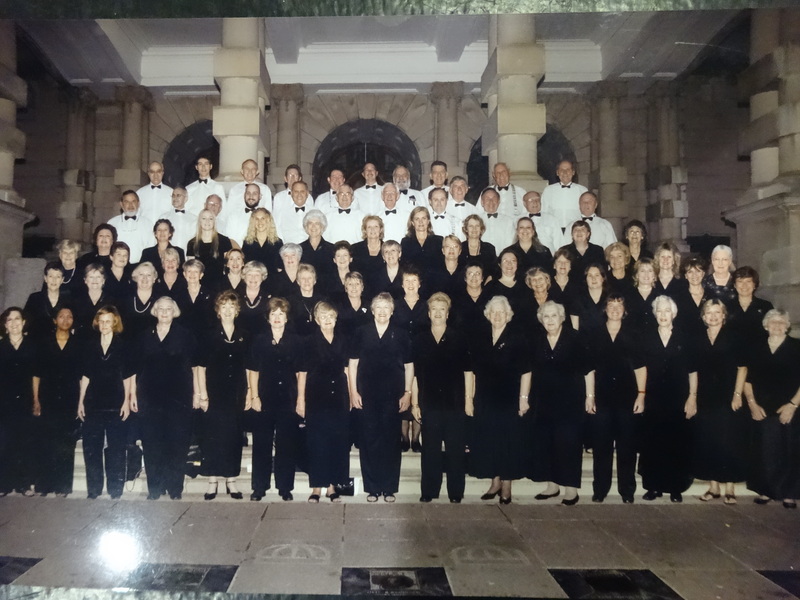 In 1997, and again in 2000, the DSC joined with other local choirs in the singing of the Hallelujah Chorus for ‘BT Voices for Hospice’. These concerts marked the simultaneous performance of this most-beloved chorus, in aid of hospices worldwide, in 43 countries! The DSC has joined the KZN Philharmonic Orchestra (KZNPO) in performing Beethoven’s dramatic 9th Symphony on several auspicious occasions, including the 1983 inauguration of the orchestra, the 1986 opening of The Natal Playhouse by the State President, and the KZNPO’s 25th anniversary. The exuberance of the uplifting ‘Ode to Joy’ in this musical masterpiece never fails to touch a chord in the hearts of those present. Carl Orff’s Carmina Burana too, for its thrilling drama, is an unfailing crowd pleaser. Other major choral works performed by the DSC include Bach’s St Matthew Passion, Haydn’s The Creation, the Requiems of Verdi, Brahms and Andrew Lloyd-Webber (SA premiere performance in 1991) and Mendelssohn’s Elijah. During South Africa’s hosting of the 2010 Soccer World Cup, the DSC extended its repertoire to singing in isiZulu, performing the premiere of Sibisi’s Zulu Mass in B flat, and the exciting Shaka Zulu by Mzilikazi Khumalo. DSC has enjoyed working under many fine conductors, among them Maestro Naum Rousine – a familiar figure on the podium, who has annually conducted the DSC since 1995. Founding choir member, Nancy Dunsmore, remembers with awe Maestro Piero Gamba, a musical genius who, at the young age of 32, ably conducted the DSC and orchestra in a performance of Beethoven’s 9th Symphony without the aid of a score! The DSC was privileged to be conducted by eminent British composerr John Rutter, in 2002, for the African premiere of his compilation of American spirituals, Feel the Spirit and has subsequently performed his Requiem and Mass of the Children. Many hundreds of choir members and numerous audiences have, over the past fifty years, been enriched by the DSC’s rich repertoire which, as well as its solid classical base, incorporates light classical works, items from musicals and pop operas. It is the DSC’s hope that the work begun fifty years ago – mastering choral compositions for our own enjoyment, and the pleasure of our audiences – will continue for many years to come.